With PAOFLOW we introduce an efficient python utility for high-throughput first principles calculations that is easy to install and operate. The key components involve managing sets of calculations to determine band structures, density of states, complex dielectric constants, diffusive and anomalous spin and charge transport coefficients, etc. using a methodology which generates finite basis Hamiltonians from the projection of first principles plane-wave pseudopotential wavefunctions on atomic orbitals (PAO). PAOFLOW is a software tool to efficiently post-process standard first principles electronic structure plane-wave pseudopotential calculations to promptly compute from interpolated band structures and density of states several quantities that provide insight on transport, optical, magnetic and topological properties such as anomalous and spin Hall conductivity (AHC and SHC, respectively), magnetic circular dichroism, spin circular dichroism, and topological invariants. The methodology is based on the projection on pseudo-atomic orbitals (PAO). Additional features of PAOFLOW include the calculation of selected integrated quantities using adaptive smearing, the ability to add spin orbit coupling using parametrized methods, and the calculation of surface projected band structures. PAOFLOW is also integrated in AFLOW𝛑: http://aflow.org/src/aflowpi. 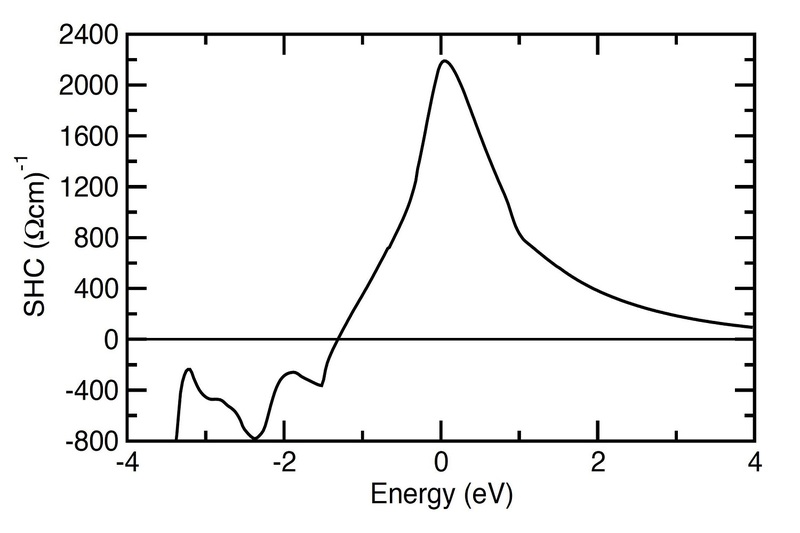 EXAMPLE01: Silicon with an spd pseudopotential (bands, density of states, projected density of states, Boltzmann transport and dielectric function). 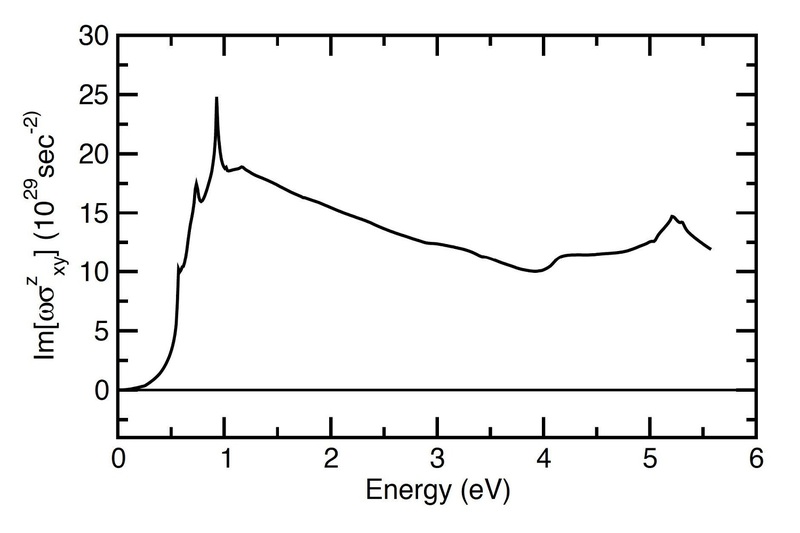 EXAMPLE02: Aluminum with an spd pseudopotential (density of states, Boltzmann transport and dielectric function). 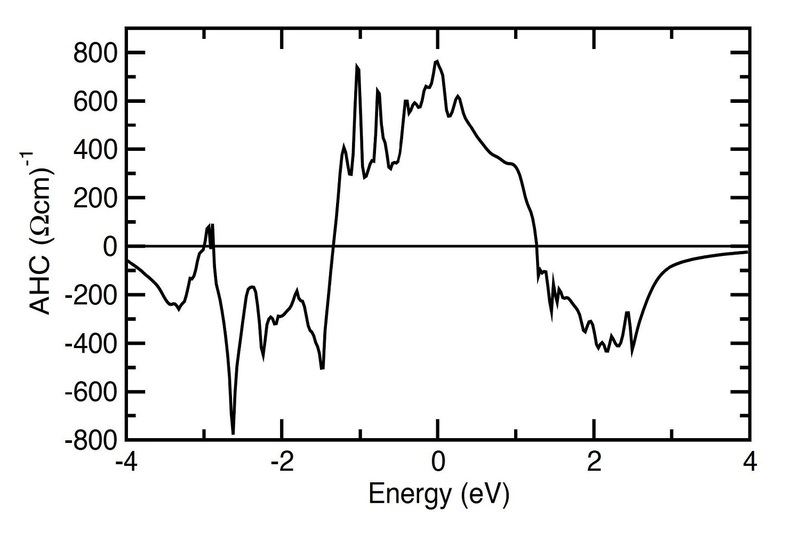 EXAMPLE03: Platinum in the local spin density approximation (density of states, projected density of states, Boltzmann transport and dielectric function). EXAMPLE04: Iron with non-collinear magnetism and spin-orbit interaction (bands, band topology, density of states, anomalous Hall conductivity and magnetic circular dichroism). EXAMPLE05: Platinum with non-collinear magnetism and spin-orbit interaction (bands, band topology, density of states, spin Hall conductivity and spin circular dichroism). EXAMPLE06: AlP with ad hoc ACBN0 correction (bands, density of states, Boltzmann transport and dielectric function). EXAMPLE07: Bismuth with the effective spinorbit interaction approximation (bands, density of states). Below are some sample results. 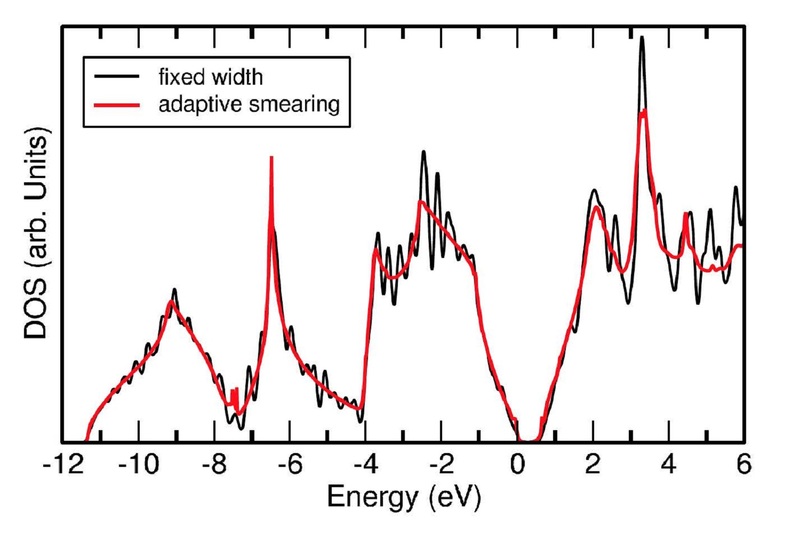 Comparison between fixed width and adaptive smearing for the density of state of Silicon. The calculation is done on a 18x18x18 MP grid and with W=0.1 eV in the fixed width smearing algorithm. Data adapted from example01. Top panel. Band structure of Fe including spin-orbit interaction. Bottom panel. Berry curvature. Data adapted from example04 and evaluated along the AFLOW standard path for the BCC lattice. Energy resolved anomalous Hall conductivity in Fe. Data adapted from example04 using a 42x42x42 MP grid and adaptive broadening yielding a converged value for the AHC at EFermi of 751 (Ω*cm)-1 in excellent agreement with the previous results. :M. Gradhand,et al., First-principle calculations of the Berry curvature of Bloch states for charge and spin transport of electrons, Journal of Physics: Condensed Matter 24, 213202-24 (2012). 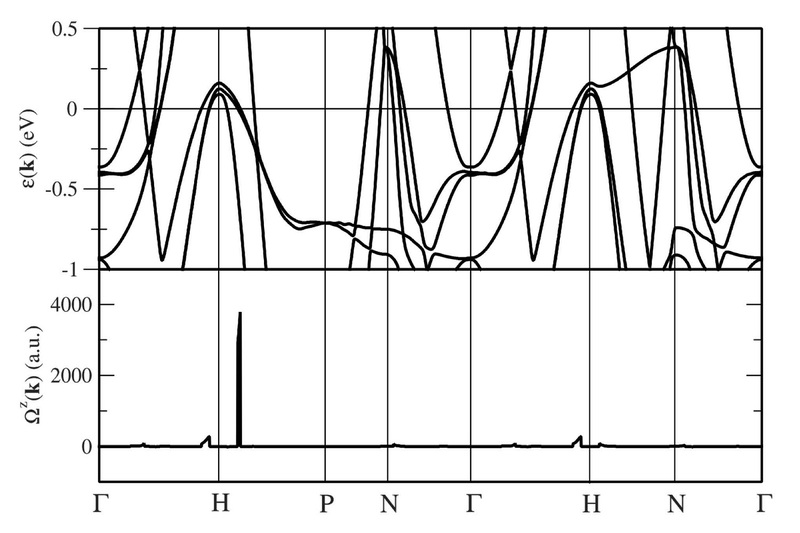 Magnetic circular dichroism spectrum of Fe. (Red) circles are experimental data from Ref . Data adapted from example04 using a 42x42x42 MP grid and adaptive broadening. 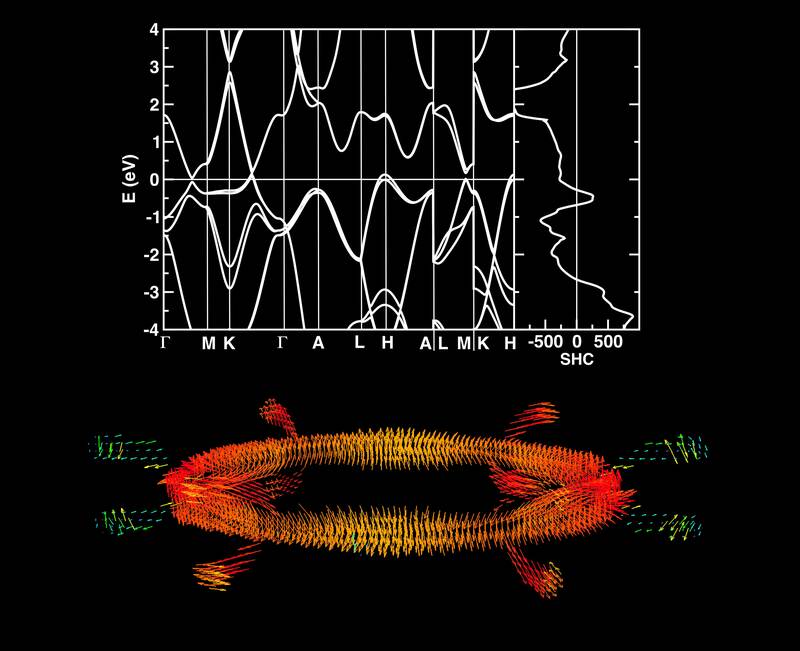 :Y. Yao, et al., First Principles Calculation of Anomalous Hall Conductivity in Ferromagnetic bcc Fe, Physical Review Letters 92, 037204-4 (2004). 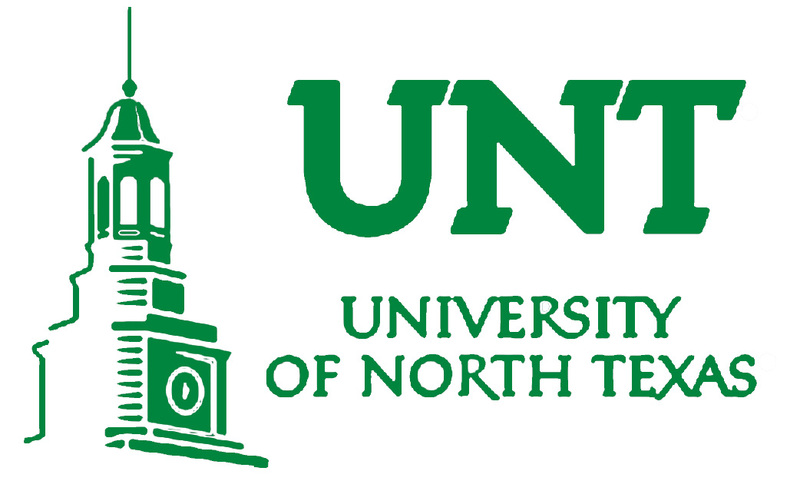 Energy resolved spin Hall conductivity in Pt. Data adapted from example05 using a 42x42x42 MP grid and adaptive broadening yielding a converged value for the SHC at EFermi of 2170 (Ωcm)-1 in excellent agreement with previous experimental and theoretical results. :G. Y. Guo, et al., Intrinsic Spin Hall Effect in Platinum: First-Principles Calculations, Physical Review Letters 100, 096401-4(2008). 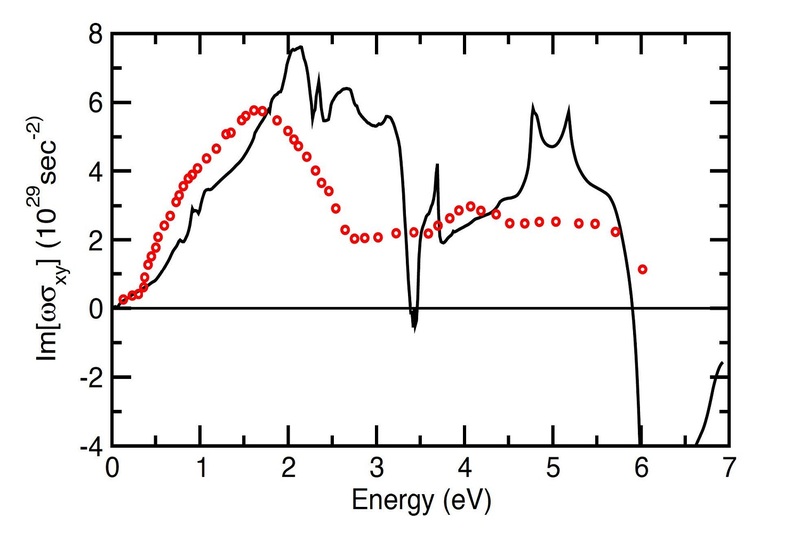 :G. S. Krinchik and V. A. Artem'ev, Magneto-optical properties of Ni, Co, and Fe in the ultraviolet, visible, and infrared parts of the spectrum, Sov Phys JETP 28, 1080. Spin circular dichroism spectrum of Pt. Data adapted from example04 using a 42x42x42 MP grid and adaptive broadening. Should you have any questions or feedbacks, please consider posting on the PAOFLOW or related sections at the AFLOW Forum: http://aflow.org/forum/. Thank you.